Seton Hill University, founded by the Sisters of Charity in 1885, is an innovative center for learning, offering a variety of educational opportunities to diverse populations. 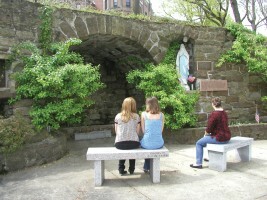 Historically, the identity of Seton Hill University was rooted in a strong connection to the Catholic Church through the founding religious congregation, the Sisters of Charity. The values and teachings of the Sisters were evident in the academic curriculum and in student life. Seton Hill prizes its Catholic intellectual heritage and the Judeo-Christian tradition in which the Sisters established the University. It values the cumulative wisdom of the past, reveres human creativity and human intellectual capacity in all of its dimensions and is mindful of the life of the spirit. Drawing on these traditions, through guidance and example, the University stresses both community participation and respect for the individual. It leads students to value the graces of courtesy, kindness, compassion, dialogue, and respect for diversity. With full-heartedness the University is committed to making our world a better place than it has been and working with our students to accomplish that end.